BULAWAYO South Constituency losing independent candidate in last year’s harmonised elections Josphat “Mzaca” Ngulube and popular former entertainment promoter and DJ Marshal Mpofu have been arrested for allegedly taking part in the violence that rocked the country recently resulting in the destruction of property worth millions of dollars. Ngulube (34) and Mpofu (37) are among 10 other suspects who appeared before Bulawayo magistrate Mr Franklin Mkhwananzi facing public violence charges. 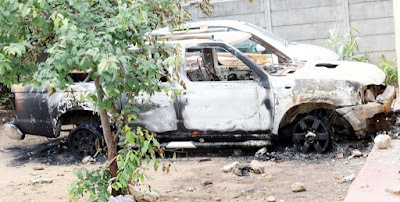 They are accused of having burned three cars, destroying a precast wall and breaking several windows of a house belonging to Zanu-PF Bulawayo provincial women’s league chairperson Cde Eva Bitu. They will appear in court on Thursday for trial. The other suspects are Esther Mbewe (53), Fortune Masuku (29), Melusi Moyo (32), Lavenda Moyo (66), Thabisani Ngwenya (32), Otilia Sibanda (34), Angeline Mwemba (41), Minenhle Mahlangu (28), Mwale Chifufu (34) and Duduzile Amisi (39). According to the State’s case as presented by Ms Grace Zhou, on 14 January at about 7am, the accused persons, acting in connivance with 100 others, unlawfully blocked free movement of traffic at an intersection along Sizinda Road and Nketa Drive. They allegedly engaged in acts of violence. They went to Cde Bitu’s residence and threw stones and destroyed a precast wall to gain access to the yard. They destroyed window panes before torching her three cars, a Ford Ranger, Nissan NP 300 and a Toyota Vitz. “They also damaged roofing sheets and the complainant managed to escape uninjured together with her family,” said Ms Zhou. The court heard that the accused persons proceeded to Tshabalala Housing Office and clinic where they allegedly stoned the buildings.